Recently I have been on a decluttering mission! Several months ago I harvested all the lavender flowers growing in my garden (we have a whole border of them) and put them in a big bucket where they remained. My intention was to strip the flowers off the stems and do something with them. 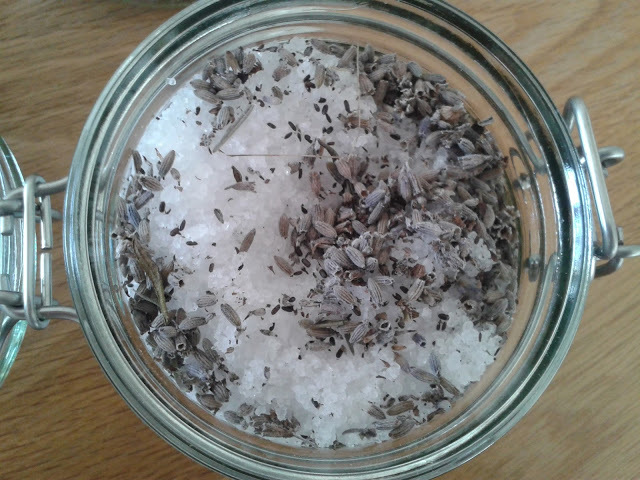 I finally got round to it and filled a few jars of lavender flowers mixed with salt and a vase with plain lavender as pot pourri as you can see in the pictures above and below! I also found when I was stripping the flowers from the stems that lots of seeds fell out, so now I have a little jar of lavender seeds! Pour salt and lavender flowers into a jar and mix together (add around 3 or 4 times as much salt as lavender flowers). Sprinkle a spoonful or two into a hot bath and enjoy! Alternative display in a nice jar and give as a gift! I actually bought the jars pictured above from Ikea and paid 80p each for them. Yes really I went to Ikea, but I had a good reason – I was taking advice from one of the comments on this blog post here. 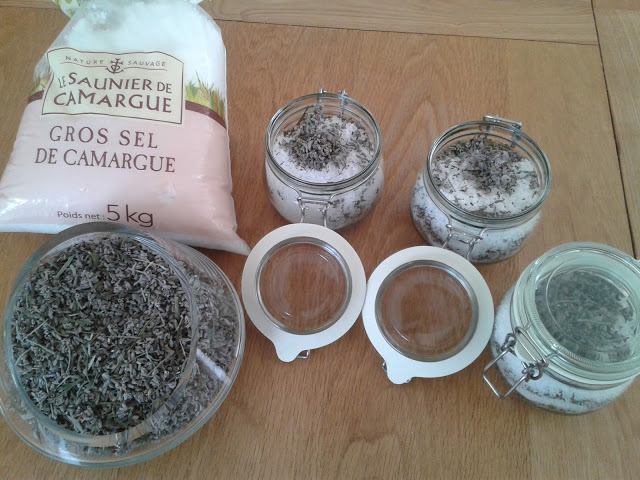 The lavender grew in my garden so didn’t cost anything except my time (the plants were a gift) and the salt I bought in bulk in France when we did our house swap a couple of years ago (read more here). We went on a tour of a salt marsh in Aigues Mortes, which I found fascinating and saw the different stages the sea water needs to go through until it evaporates entirely and becomes salt! I think I paid around 6 euros for 5kg’s of really good quality very attractive sea salt! For one of those lavender salt jars it cost me around £1. Alternatively you could spend £14.50 here on a very similar product, although it contains lavender oil instead of actual lavender – you could put a few drops of lavender oil in the bath as well if you feel the need! Local unpackaged or failing that bulk bought or cardboard packaged sea salt limits packaging waste and airmiles! Also you don’t have to stick to sea salt – rock salt, epsom salts, even bicarbonate of soda are included in lots of bath salt recipes – use up what you have first! Home grown or locally grown lavender also reduces air miles and packaging. If you don’t have any lavender try other herbs – make sure there aren’t any bits that will clog the drain though! You don’t have to go out and buy a jar – just reuse a jam jar (I was very restrained on my trip around Ikea, but I couldn’t resist these jars, as as much as I try I’m not very good at making jam jars look good). If you are looking for other ideas for things to do with lavender, lavender wands are lovely – see how to make them here, bunches of lavender in vases look beautiful and lavender also tastes great as a herbal tea – make sure it hasn’t had a pesticides or anything sprayed on it first though! This entry was tagged bath salt, DIY, Health and Beauty, home grown, home made, plastic free, recipe, salt, zero waste. Bookmark the permalink. ← Emma’s stylish Laura Ashley toilet wipes!